Prospect vs Lead vs Opportunity – What’s the Difference? These sales terms get thrown around all the time. But what really is the difference between a Prospect vs Lead vs Opportunity? There’s so much confusion around prospect vs lead, lead vs opportunity, prospect vs opportunity. Are they all the same? Terminology in sales isn’t just jargon, and it can be confusing. So many different ways to slap a label on someone. Sadly, there are so few sales facing teams who have a solid grasp on the terms. To tackle to overall confusion, we’ve laid out three of the most commonly used terms here in one post. We’ll examine and cross-examine each one until you have firm understanding of each. Why Do You Even Need to Know? Correctly ascribing individuals or brands in your sales funnel will help you figure out how to treat them. Imagine your sales and marketing team as journalists. Not the left/right garbage we’re all getting sick of today. Think about back in the day, when stories were written late at night with fedoras and cigar smoke. So, the short version is leads, then prospects, then customers. What is a Sales Lead? Again using our journalist example, think about this in terms of needing a story for the front page of the Sunday edition. What is it that you need to get started? You’re looking for someone to speak with that could give you something to look into. It could be someone in the rolodex, or someone coming to you with a story that will break wide open (probably in a dark alley like in the movies). Are they a good lead that will give you a front page story, or is it a dead end? It all depends on how the conversation goes. It’s not that difficult to directly translate this to the business world. Either you buy or put together a list of your own leads (e.g. rolodex), or via inbound techniques/advertising they come to you (e.g person coming directly to you). The job for you or your team? You need to decipher which leads could make it to print (or closed-won) and those that aren’t worth the time. Start by knowing the type of stories buyer personas that really fit into your newspaper organization. Again, the lead could be nothing, or there could be something that makes you want them to stick around and keep talking. The point is: a “Lead” isn’t a sure thing. One of the dictionary definitions states that a lead is, “a slight or indirect pointing to something”. When a lead comes into your outreach process, they should fit a certain mold. Whether that is certain firmographic/demographic data or someone who is interested in your advertising or content online. That said, they may have made little to no indication of interest in your products. That’s because leads need to be qualified. Higher quality names in the beginning should give you a higher percentage of leads who move along in the overall sales process. However, you won’t know until you have a conversation. Typically, reps will have to chip away at leads in order to have an initial conversation. Names on a list: Either one you’ve drummed up yourself through research, or bought from a third-party. Referrals: Either from colleagues or current clients. People who’ve responded: If someone responds to your cold emails and phone calls, they’re still a lead until you qualify them a bit. Inbound/Advertising: They’ve come to you and want answers. A great place to be in the sales world. Before you can say that they are no longer a lead, you have to speak with them. There has to be an initial conversation for reps to determine whether or not a lead is either an uninterested party or our next term. Depending on whether or not you’re B2B, Tech, or even direct to consumer, the questions are going to be different. All questions should be used to help you determine how likely a lead is to close. Level of Pain: Are they really ready to switch solutions to solve the pain? Ask questions about why they are looking for something now. If it’s a “meh” type answer, they shouldn’t move on. Logistical Issues: Budgeting, timeframe, buying cycle. Questions that determine the likelihood of a close in terms of time and money. B2B cycles can be a long time, but that doesn’t disqualify a lead (necessarily). Competition: Find out what current provider they use (if applicable) and why. It’s important to know how you differ from leading comparable tools. 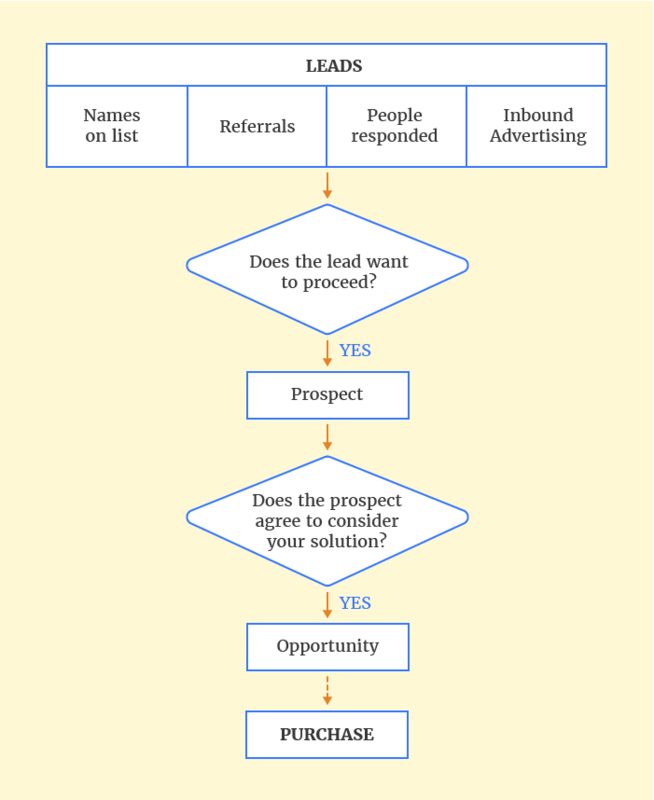 What is a Sales Prospect? Imagine you’ve called on one of your leads and received a great tip that could just be the story you’ve been looking for. You’ve asked them the questions and they’ve answered them all with the details you hoped to hear. At this point, your lead becomes a prospect. Following a prospect is where the real legwork begins, but it’s also the exciting part. In the business world, it’s just as exciting. The lead has been qualified and hopefully is willing to have continued correspondence with you. This lead has the problems that your products solve, a budget that warrants your pricing, and a timeline that puts them near ready for a decision. However, you may not get the sale right away. In B2B scenarios (especially larger organizations) there are multiple people involved in the buying decision. The data suggests 5.7 on average. For this, your one-lead story becomes a multi-person operation. More interviews, finding the right person to talk to, and schmoozing everyone in order to get the intel that you want. Call it journalism, call it sales — not much of a difference. Just make sure that you factor that into your overall process to deem it worthwhile. If a prospect is close to making a decision, but needs a ton of work dealing with multiple influencers; you’ll want to factor that into your efforts. Prospect: A lead that has proven to be a fit for your products/services and is progressing toward a decision by having a continuous conversation with a sales rep.
For these reasons, the prospect stage isn’t necessarily a short one. This phase could actually be the longest, given the direct time that you’ll be involved. Leads are leads until you get to have a conversation. Prospects are prospects until they move into the opportunity phases (our next definition), or are ruled out due to other factors (e.g. cold feet, change of personnel, unforeseen issues). Although, you shouldn’t continue to call them “prospects” if they aren’t progressing toward a decision. This doesn’t mean they won’t buy, but it could be a time when they aren’t seeking a solution and aren’t a viable prospect for a closed deal. Note: There is another definition for prospect that we didn’t include here for the sake of confusion. Essentially, a prospect (by this second definition) is a company/individual that fits into a particular buyer persona. Before you contact them, they are already a prospect by this definition. We opted not to detail this one out. What is a Sales Opportunity? You’ve talked to all the people involved in the story, you’ve done a stakeout to catch the culprits in the act, and you’ve even filled up one of those little memo pads with all the notes for your story. Now, it’s time to put it all on the line and pitch your story. Often times in the boom of print media, reporters would have to write out the story and put it on the editor’s desk — hoping for the best. Sure, you’ve done your best to determine the fit and have extracted all the juicy details to make things as interesting and beneficial as can be. But it all comes down to whether or not, the decision maker thinks it’s worthy of a spot on the page (purchase). That’s what an opportunity is for reps. It’s the point in which a prospect agrees to consider your solution. Important: If a prospect is not willing to seriously talk about and consider either changing from their current solution or just using you for the first time — they are not a prospect. But, they should be re-engaged at a later time to see if the lead is ready to consider a new solution. You obviously desire to sell your products to those who need them. Therefore, the opportunity hinges on the potential customer. Once your prospect decides they need to consider your solution, it genuinely is an opportunity. You can’t sell to someone who’s not interested. You can explain the benefits and pour salt in the wound of their pain, but it takes willingness to consider for there to be potential. You’ve done some fine journalism, but it’s time to write the story. All the opportunity in the world won’t sell itself. The most interesting story interested decision maker still needs to have a call-to-action. For journalists, it means retelling what you’ve lived through. If you’re a sales rep — it means using the intel you have, getting on the phone and having a conversation. Hopefully our analogy and definitions have helped bring some clarity to your sales process. 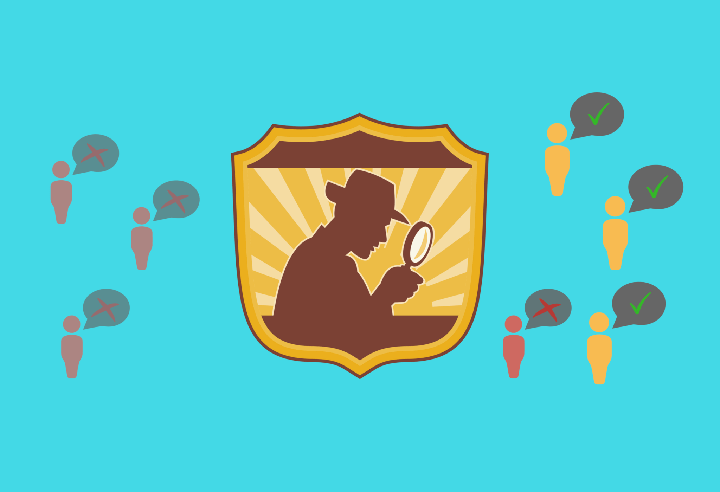 Now, it’s up to you to utilize the information and identify those in your outreach funnel. Take the information and use it to close more deals. Use this for you (or your rep) and differentiate a prospect vs lead vs opportunity in your funnel. Grab yourself one of those little memo pads and a fedora and get to work on turning some leads into prospects and turning those prospects into opportunities. Have any questions about prospects vs leads vs opportunities? Ask in the comments below! Justin McGill is the Founder of LeadFuze - a lead generation platform that discovers and contacts new leads for you automatically. Very well said, Justin. I like how you cleverly used journalism in explaining sales terminologies. Lead and prospect are two common terms that we regularly hear in sales and marketing world. Sad to say, there are still slight confusion between these two. Others still say that prospects are equivalent to sales leads. Hopefully, with your clear explanation, these differing definitions end – eventually. To add, there are CRM systems that uses the terminology “account or contact” instead of “prospect”. Aren’t these sentences uncompatible? Are they still prospects, even without considering your offer? Good catch, Daniel! They are NOT a prospect if they aren’t progressing toward a sale. The content has been updated. Can you please detail more concretely the difference between a prospect and an opportunity? What concrete actions do you take with an opportunity to capitalize on it? An opportunity is someone that’s qualified (fits your target market / meets requirements to being a customer) that has shown interest in your solution.